For those who are thinking about visiting Ecuador, I say book your flights and start planning your trip. There are so many interesting things to do in Quito. Ecuador is an affordable destination to visit in South America and it has gorgeous natural landscapes and rich culture. Ecuador exceeded all of my expectations for adventure, especially since it’s not every day that I get to go river rafting in the Amazon! Overall, Ecuador left a lasting impression. Ecuador’s incredibly green landscape and mountain views! Before my trip to Ecuador, Melissa from Melissa in the Middle and I bonded over our upcoming trips. 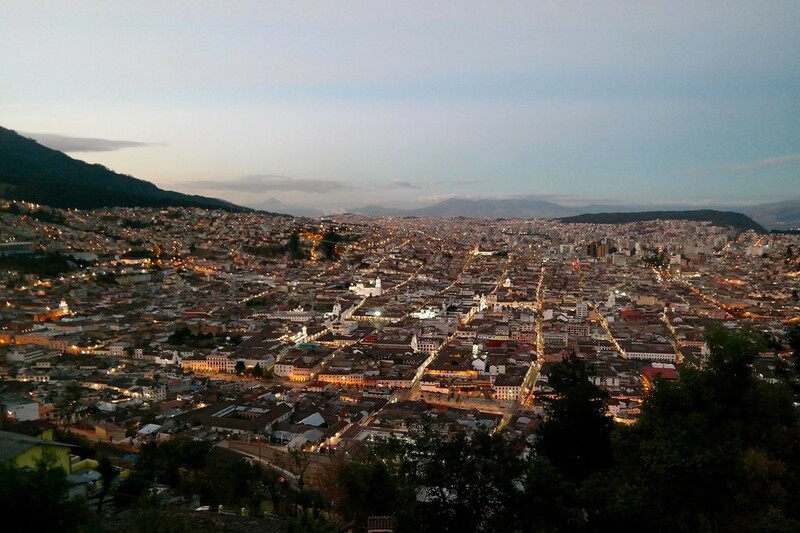 Together we created this guide that highlights things to do in Quito and perhaps what to skip. If you’re considering an Ecuador backpacking route, start in Quito and head to Banos, Otavalo Market, and Mindo. I explored Quito mostly by walking on foot. Despite being a very large and hilly city, I spent a full day roaming around. I walked into local shops, ate at small establishments and checked out a few art galleries. When I got tired of walking, I hopped in a cab which was super affordable. Just be careful when crossing the street, traffic is intense in Quito! If you are just arriving in Quito and you’re feeling a bit discombobulated by the altitude, it’s worth shrugging off the discomfort to get out and see some of the sites in this amazing South American capital. The energy of the city will help cure your ills as you stroll through Old Town Quito admiring the amazing architecture. While exploring Quito, if you’re backpacking Ecuador on a budget, don’t miss climbing to Rucu Pinchincha for one of the best views of the city and Cotopaxi. 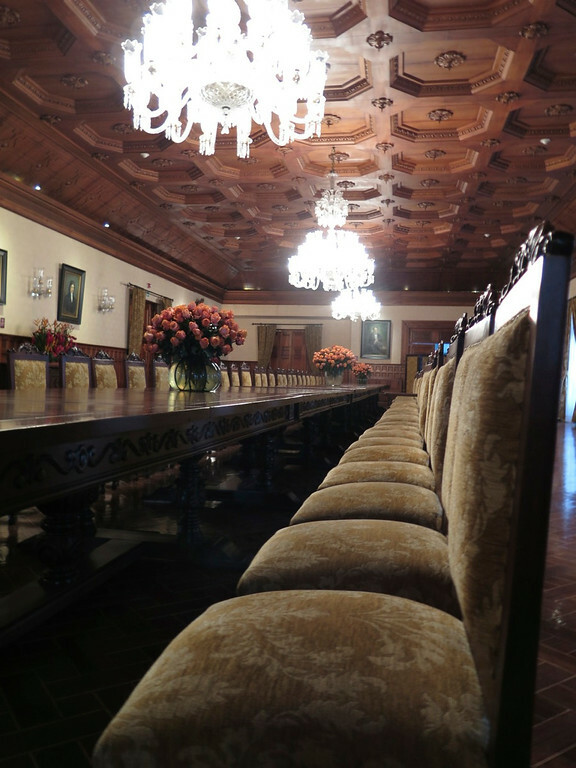 The elegant Plaza Grande is a great place to start your tour of Quito’s Centro Historico. From here, you can get your bearings on a walking tour, bus tour, or just spend an hour people-watching and taking photos. Religion plays a large part in the lives of most Quiteños. 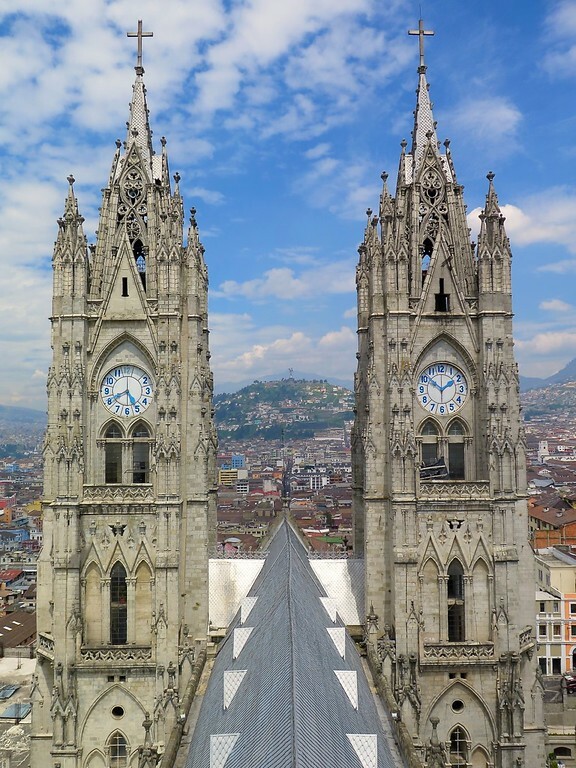 Some of the most impressive structures in Quito are the churches. If you go to the Plaza Grande (in front of the Presidential Palace) and do a 360-degree turn, you’ll have a church within your view for the full spin. The buildings in between the churches are grand and the hills rising up to different sections of Quito offers a dramatic view. 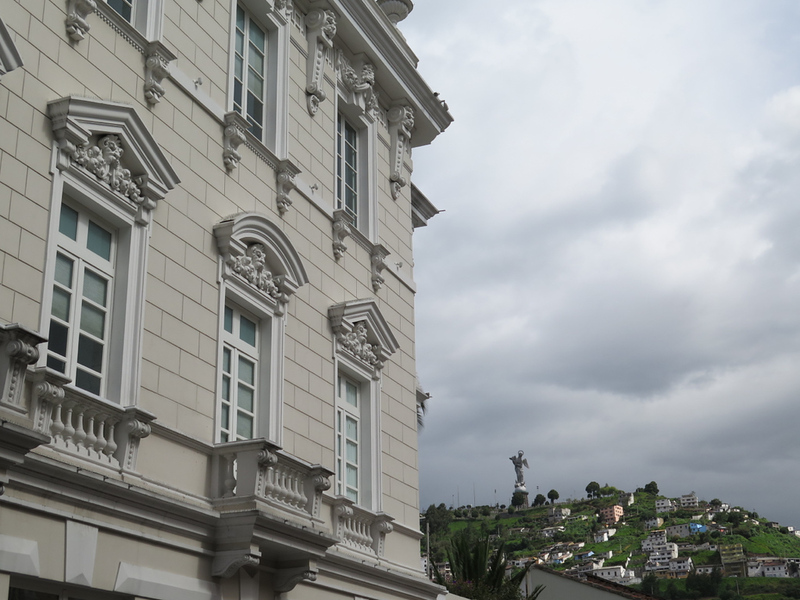 Add a few moody skies and Quito is an amateur photographer’s dream come true! You can visit the churches for a small entrance fee of $1-$3 USD. The price of admission will usually include a tour but most of the tours are in Spanish. If you’re on a budget, choose wisely. I recommend that you shortlist La Compañía de Jesus and the Basílica del Voto Nacional. It’s best to choose two or three. There are a lot more things to do in Quito. I highly recommend the Presidential Palace tour. Not only is it free of charge, but the tour guides speak English. 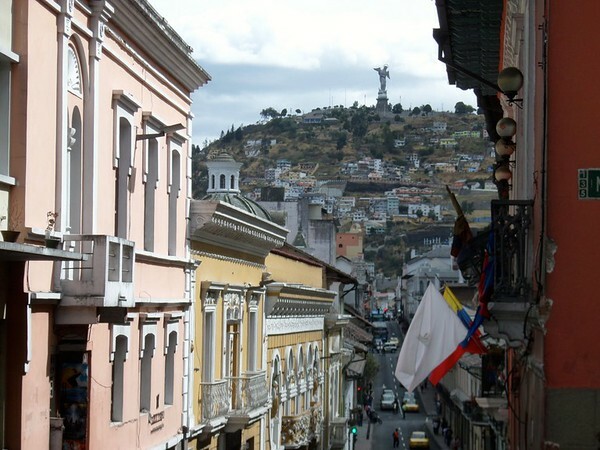 On this tour, you learn about Quito’s historical background. You can also get a great view of the Plaza Grande and El Panecillo from the palace balcony. The security guards at the Presidential Palace will check your identification. Remember to bring your passport (or at least a photocopy of it). Watch your step! The sidewalks are narrow and traffic moves quickly. Views of the Panecillo walking into the city center. One of my favorite things to do in Quito was visiting the El Panecillo. On top of El Panecillo (The Little Bread Loaf), stands the statue of the Virgin of Quito. The Virgin of Quito is made out of 7,000 pieces of aluminum, has angel wings and wears a crown of stars – truly one of a kind! From the hill, you can see all of Quito and even the snow-capped volcanoes in the distance. Get a great view of the sunset from the Panecillo! The Virgin of Quito is not very photogenic at sunset. Many guidebooks suggest arriving early in the morning for the best views. I have to agree! 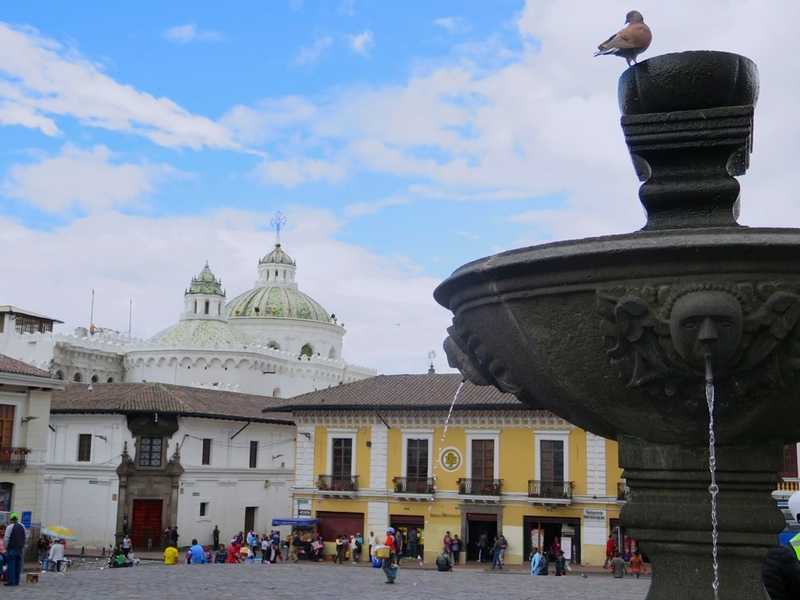 Quito is a great starting point for exploring Ecuador to explore the surrounding areas like Mitad del Mundo, Cotopaxi National Park, and the Otavalo Market. Mitad del Mundo Monument in Quito. If you’ve ever wanted to straddle the equator, Ecuador is one of the 13 countries that the equatorial line passes through. 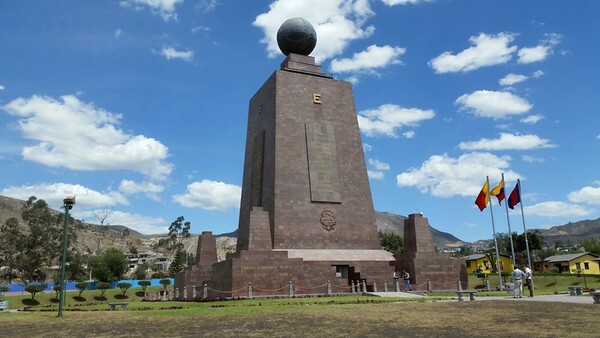 Visit the Mitad del Mundo to stand on the equator. Less than an hour drive from Quito, the Mitad del Mundo or Middle of the World is a large complex with museums, restaurants, and shops. The real equatorial line is a few doors down. After the GPS, historians confirmed that the monument is on the wrong site – whoops! The real equatorial line is at Museo de Sitio Intinan. 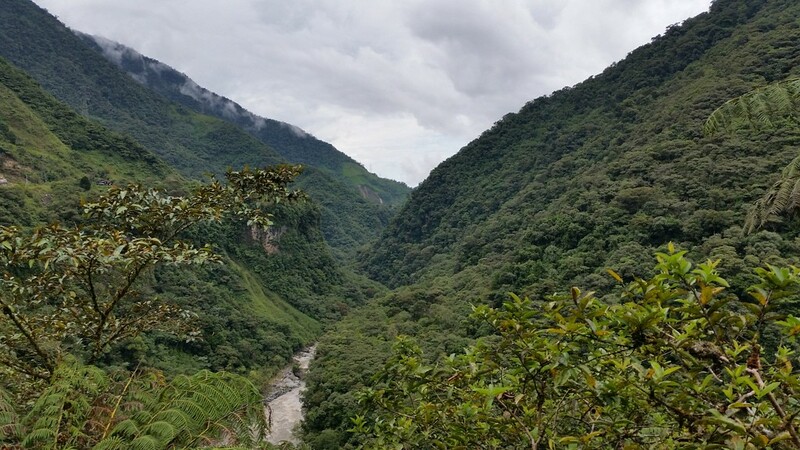 Another incredible destination in Ecuador is the lovely and lush Mindo. Whether you visit during a day trip from Quito or spend several days, you’ll fall in love with this small town in the cloud forest. 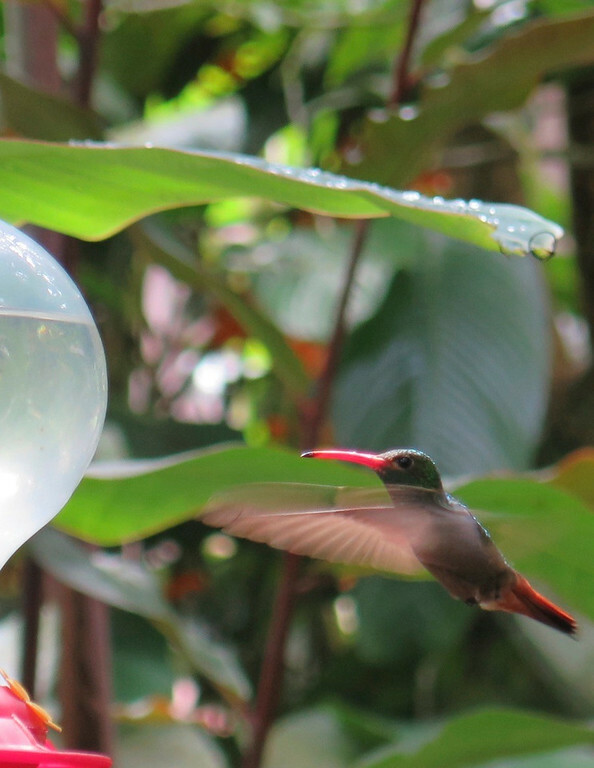 Mindo’s hummingbirds are the resident pixies. 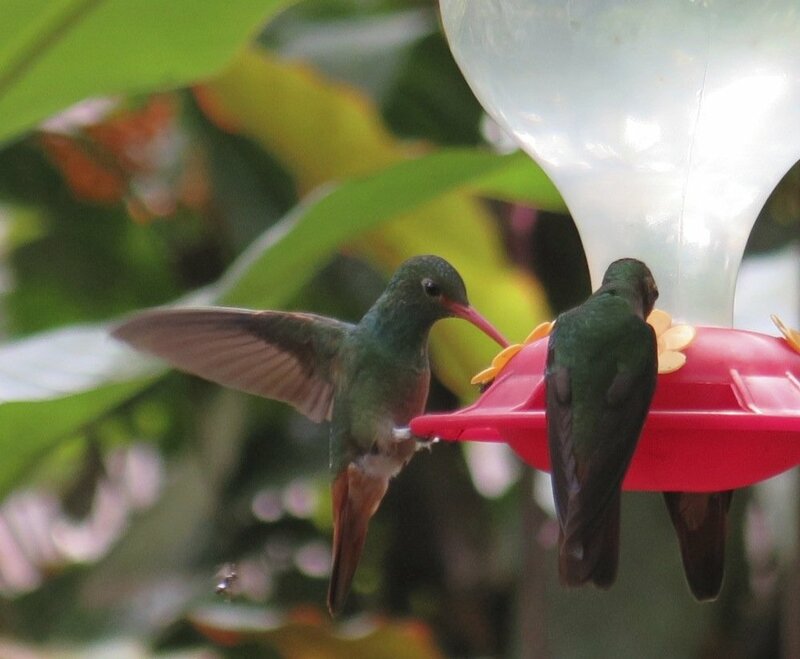 Although you can book a hummingbird tour at any guesthouse, I was content with photographing them flitting around the bird feeders in my hostel’s garden. I spent most of my Mindo budget at El Quetzal, a café that specializes in chocolate. Why? Because they make their own! At El Quetzal, there are chocolate trees growing on the property. 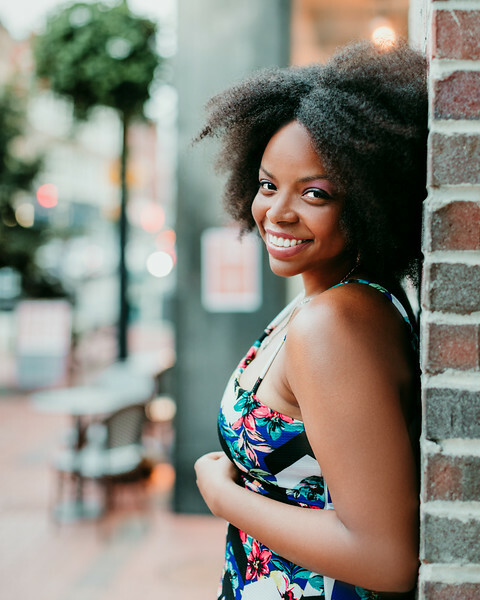 You can learn about the entire production process in the ‘Bean to Bar’ tour ($10 USD). The other part of my budget went to enjoying brunch in the El Quetzal café. It was a tad expensive for Ecuador (around $8-$10 USD), but I loved using the free wi-fi. Join a one-hour chocolate tour seven days a week. Mindo is a popular weekend destination for Ecuadorians. If you want to avoid crowds or price gouging, plan your visit on a weekday. If you are visiting Mindo on a day trip from Quito, call ahead for reservations. For less than $20 USD, zip-line through Mindo’s cloud forest on 13 cables. As you hike deeper into the forest, the views of the mountaintops get better and better! You can also enjoy other activities like hiking, canyoning, tasting hand-crafted beer and tubing. Unfortunately, I arrived at Quilotoa after sunset so I missed what could have been one of my biggest adventures in Ecuador. Get to the water-filled caldera early for a day trip, or spend a few days trekking the Quilotoa Loop. The rigorous hike is worth the spectacular views of the lagoon. 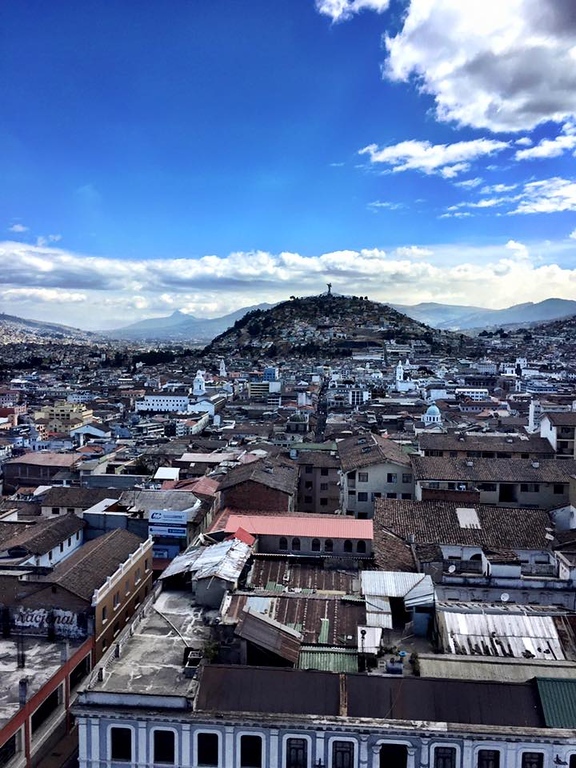 What are YOUR favorite things to do in Quito?